Prattville's Way Off Broadway Theatre was formed in the fall of 2002 as a part of the Prattville Creative and Performing Arts Council. The 2019 season will open with The Amen Corner by James Baldwin, directed by Tara Fenn. This drama set in Harlem will open on February 14 and will run through March 3. 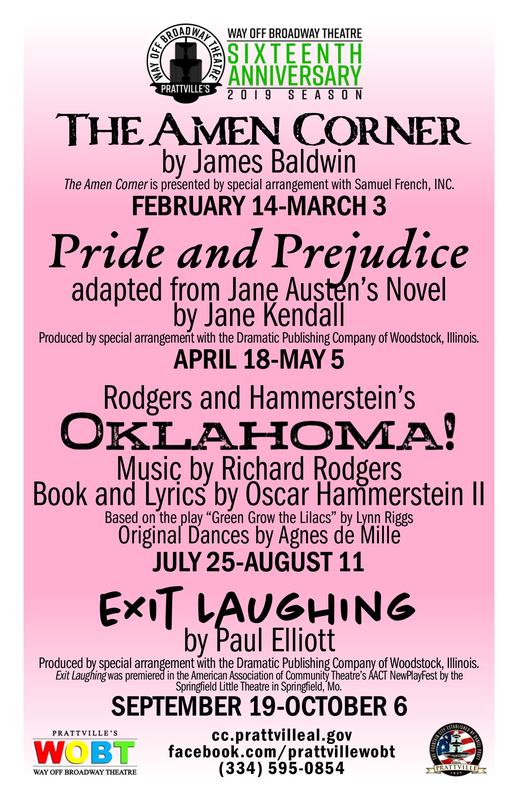 The Amen Corner is presented by special arrangement with Samuel French, Inc.
Jane Austen fans will be excited to learn that Pride and Prejudice, directed by Pamela Trammell, will open on April 18 and run through May 5. Travel with us to 19th century England through Pride and Prejudice, adapted for live theatre by Jane Kendall from the novel by Jane Austen and produced by special arrangement with the Dramatic Publishing Company of Woodstock, Illinois. Rodgers and Hammerstein’s OKLAHOMA!, directed by Sam Wallace, will open on July 25 and run through August 11 and will transport the audience to a farm in the Oklahoma Territory. Music is by Richard Rodgers, book and lyrics by Oscar Hammerstein II, and the musical is based on the play “Green Grow the Lilacs” by Lynn Riggs, with original dances by Agnes de Mille. Finally, we will return home to the great state of Alabama with the hilarious play, Exit Laughing, by Paul Elliot, directed by Michael Proper. Exit Laughing is produced by special arrangement with the Dramatic Publishing Company of Woodstock, Illinois, and will run September 19 through October 6.